Her classes are recommended for people who wish to create optimum health for themselves, their families, clients and friends. At Santa Cruz County Veterans Administration I teach Tibetan Tai Chi classes for the Bridging Warrior Program, Tuesdays 10:30am. 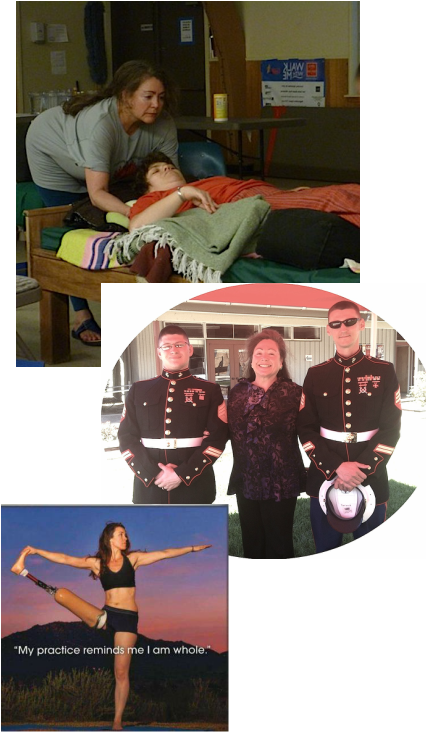 I am Credentialed by the Veterans Yoga Project, Washington D.C. in Resiliency Training to help ease the effects of the many layers of PTSD through my classes. "I believe that Chi or life force flows freely within the healthy body. But when blocked, "dis-ease" and illness can follow." This series of Tai Chi movements improves mental focus, fine motor skills, reflexes, and hand-eye-coordination, helping children become better at organizing their brains. These classes are taught throughout the Santa Cruz, and Pajaro Valley School Districts. ...this is the area of energy medicine. Michelle can be a key element in releasing blockages, to move the body through "ease" and wellness.